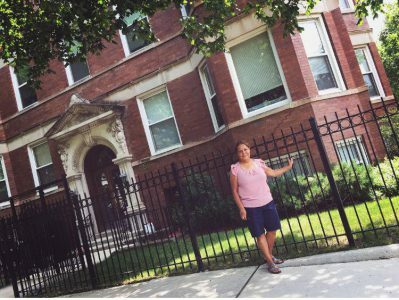 My mother, Maria Guadalupe, outside her first home in the U.S., an apartment in Logan Square. When we talk on the phone, my mother sounds apologetic. “Maybe this isn’t ‘our country,’ but we aren’t the people he describes,” she says. Trump’s announcement took her back to July 1979 when she said goodbye to her mom in Zacatecas, Mexico. She was 22, going to el norte, the North, with my oldest sister, who was 5 months old, to reunite with my father, Manuel. He was waiting for them in Chicago. It was a temporary move, my mother thought — a couple of months maybe, one year maximum — and she would be back in Zacatecas. Ten years would pass until she saw her mother again. It took my mother, sister, and five other people two days to cross the Mexico/Arizona border. They were driven from Arizona to Chicago, where my dad welcomed them in his home in Logan Square. Over the years, my mom has told me that she wanted to go back. There was no Spanish television, no Mexican food, and, eventually, she worked two shifts in a warehouse to support our growing family. My father was a stay-at-home dad. In 1986, my parents and my sister became residents when then-President Ronald Reagan granted amnesty to more than three million undocumented immigrants in the United States. While the first few months and years were emotionally and physically draining for my parents, Chicago started to feel like home. My mother made sure to keep Mexican culture in our lives. In June of 1991, 10 months after I was born, my parents, three sisters and I returned to Mexico to live. It didn’t feel right to my mom. She felt Mexico wasn’t home anymore. Our family returned to Chicago. I was raised to speak only Spanish at home. My parents didn’t speak any English and my mom wanted us to never forget where we came from. In our home, our Mexican culture was, is and will always be present. Some of my most vivid childhood memories include Vicente Fernández’s ranchera classics blasting on the radio on Saturday mornings while my mom cooked chilaquiles, or some other spicy Mexican breakfast dish. My mom’s last job was just like the first ones she took on when she arrived to Chicago: Labor intensive, work before dawn, minimum wage – from warehouse to factory jobs where she assembled Motorola cellphones and made metal locks. “That’s why we came here. We came here to work, no matter what type of job. Us immigrants, we’re hard workers,” she said recently. My mom proudly shared details of her story with me for this piece. Typing this up, I felt empowered. More than ever, I am proud to say that I am the daughter of María Guadalupe, the most hard-working, strong, courageous immigrant I know. Donald Trump should get to know her.